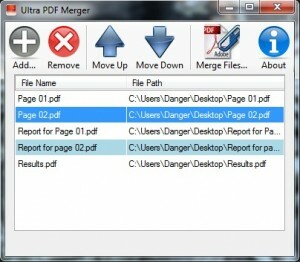 Ultra PDF Merger or UltraPDFMerger is a freeware utility that binds several PDF files into one. It is a Windows application written in C# (.NET) and as a result of that it requires .NET Framework 4.0 to run. Ultra PDF Merger uses iTextSharp, an open source library for PDF generation. You can download and update the library (.dll) file with the latest version if you want. Few months ago I had some reports (PDF files) that I wanted to bind them into one. I had a utility that until that time was merging my files successfully, I don’t want to name it here. Those reports seemed to have some characters that the utility could not read and it was failing. I have searched the internet and I have found several PDF binders, mergers and joiners but the ones I tried didn’t meet my needs, so I have decided to create one. The result of this story is the Ultra PDF Merger. It succeed when others have failed. Screenshots are taken in Windows 7 environment and it will probably look a little different in your system (especially on Windows XP). Ultra PDF Merger is portable which means you don’t have to install it. You download it, you extract it and you run it. The download file is an archive (.rar file) and you will need WinRAR or 7-Zip to extract the program files. There are many clean awards so I will add only quality awards in this section. ← Microsoft still wants to buy Yahoo! VirusTotal returned two reports of malware for the main program (UltraPDFMerger.exe). One, from AVG’s scan, is Dropper.Generic4.BEEN. The other, DrWeb’s scan, is Trojan.KeyLogger.8784. Thanks for mentioning that as other users might have the same question. The software does not contain any malicious code. I don’t know why your antivirus software has detected threat. I have approved your comment because I am sure about it and I want to clear things out. The software was tested by SoftPedia and marked as 100% clean, which is. It is also tested by almost all the top freeware sites. Don’t worry, I wrote the code line by line and I can guarantee that. I’ve also tested it and ran it through Norton, and it came 100% clean. Nice work Michalis, very simple and effective software! Thanks Xenios, I have Norton enterprise at work and Microsoft Security Essentials at home and none of them detect any (false) security threats. Works fine and really fast. but there are two issues i have with it which are all texts and pics are upside down and i am not able to save the file. Why? Am i missing something? every time i open the file i have to rotate view and when i try to save file with save as option it saves like the original everything is upside down. The program has no option for rotation (yet) and the output file will be exactly as the input files. I wanted it to be as simple as possible so everyone can use it. You can’t merge one file, you must have two or more. Also, you can’t merge locked and password-protected files. Rotation and page selection are in my todo list for version 2. Thanks for using Ultra PDF Merger. Do you plan to be able to merge selected pages from one or more PDFs? Or can you point me to a freeware product that does? Just downloaded it, so can’t make a comment – but I’m sure it’s as good as you say! Yes, I am working on the page selection. The next version will have this feature. I need to finish it and test it. I think it will be out in a week or two. I will be glad to see your comments after using it. Ultra PDF Merger v1.3 has been released. It has page selection functionality. I couldn’t get this to work at first as I did not select the itextsharp.dll file. I had copied the Ultra Merger to my Desktop. When I dropped the .dll file to the desktop, it worked perfectly. I don’t like to leave these type of files on my desk top. Would it be ok to create a folder and move both files to it? Yes, you can move them anywhere. Instead of copying the file to the desktop, create a shortcut. After you move the files to a folder right click on the application and select Send To and then Desktop (create shortcut). After that every time you want to run Ultra PDF Merger you can use the shortcut on your desktop. When multiple pdfs are selected for merger, I find that there are usually selected in the reverse order and each one has to be moved down. Could there be one button to reverse the order of listing at a stretch? The order you select the files is important and ignores the order of the windows explorer. You can also use the drag’n’drop feature in version 1.3.2. I have what may be a unique requirement that may not be very difficult for you to provide… or maybe it is? I have multiple pdfs to assemble for print, but want to print duplex (two-sided) so I want each input pdf to print on an odd page number. That way each “chapter” starts on the right side of the book as would be expected. My input pdfs are from various sources and they change often, but I need to print on-demand for on-going training classes. So I need an easy way to assemble each time and have the pages of each document start on an odd number page. Might this be possible to provide in an update? Hi John, it is indeed a unique requirement but it is not difficult. I will release a new version, most probably on July, and I will try to include this functionality. There is a workaround until then, you can add an empty page between the chapters if needed. Thank you for the feedback. Michalis, thanks very much for considering adding this feature. Your idea for a work-around is viable, as are several other ideas I have considered, but with the pdfs being modified by others I will always need to evaluate if an empty page is needed or not (determine if each pdf has odd number of pages or even)… not a seamless as I hoped. I will keep an eye on your page to see if you are able to add the feature. Hi John, I was planning to release a new version of Ultra PDF Merger this month with several new features but unfortunately I didn’t find the time I wanted. Since you requested the option to start each document in an odd page number I gave priority to that and it is already implemented. I will release version 1.3.5 in a week which will include this option. This is excellent piece of utility you have built. Thanks for getting it up. One quick question – can I have this executed from command prompt, where I can bind up different PDFs giving them as parameter? Is the functionality for merging pdfs using command prompt available now please?